If there’s one time of year when we all need a few healthy eating tips, it’s Christmas. ‘Tis the season of over-indulgence in rich, delicious and, sad to say, generally unhealthy food. But panic not. You can still enjoy all the goodies of the season, interleaved with some sensible eating, and not put on ten stone and spend the next three months regretting everything. 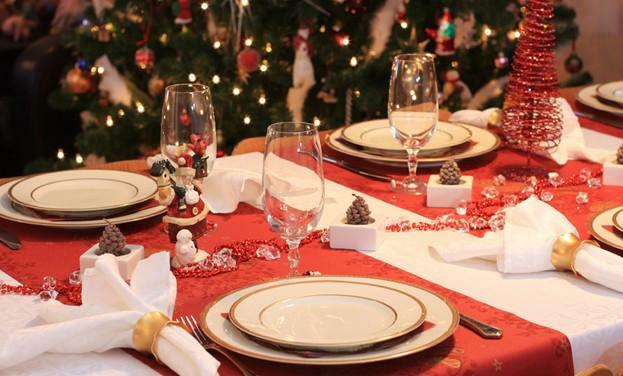 Start here, with 12 healthy eating tips for the Christmas season. 1. Feast for a couple of days, then return to normal. Buy less, and don’t let the holiday season turn into an excuse for a month of bingeing. 2. Watch what you drink. Five or more units of alcohol at a session counts as binge drinking. It’s okay to have an extra glass or three if it’s just once a year – and you’re not likely to do anything more regrettable than wake up with a headache. But for the rest of the year, spread drinking out over the week, and have one alcohol-free day in every seven, minimum. 3. Don’t keep celery just as an accompaniment for rich cheeses. Cut up a box of mini-sticks of celery, and nibble on them when you need a snack. Celery keeps blood pressure low, and helps lower cholesterol too. 4. Keep reading the labels, but don’t be fooled. Are ‘lite’ potato chips or crisps really a great health option? Yes, you could save a worthwhile 20 calories on a packet – but they’re still a high-fat food, so go easy. 5. Out of sight is out of mouth. Hide away indulgent puddings, cream and other temptations in the salad drawer, so they don’t beckon every time you open the fridge door. 6. Brazil nuts are rich in selenium, which improves mood and reduces anxiety. Eat just 3 a day. 7. Fill up healthily before a meal with a Virgin Mary – tomato juice, lemon, ice, Worcester sauce. You’ll be less ravenous when you reach the table. 8. If you’re used to working out, have a vigorous session the day before a feast, and you’ll burn extra calories more efficiently. This is not the time to embark on a new exercise regime, though, if your body isn’t accustomed to so much exertion. Save it until the New Year, and start gently. 9. Cinnamon balances blood sugar and reduces ill effects of sweet foods. Stir a little into tea or coffee. 10. Watch portion sizes like a hawk. Forego the extra spoonful, the second mince pie, never pile food high. Enjoy everything, say no to nothing – but do it all in moderation. 11. At the supermarket, avoid huge ‘bargain’ packs of special nuts, biscuits etc. Buy smaller sizes and cut the temptation. 12. Serve two vegetables with each meal (try not to smother them in cream sauce), and put salad greens in every sandwich. Follow these healthy eating tips all year round – soon, they’ll become second nature. It really is that easy.